Now. THIS. Is. A. Movie. I mean, wow. Wow! This is known as one of the greatest films of all time, and it most definitely deserves that title. This is one movie that everybody should see, it’s an instant classic, it’s.. it’s.. let’s get to the story. My sister might think it means ‘white house’, but Casablanca is in fact a town that anyone trying to escape Nazi, Germany, somehow ended up in. 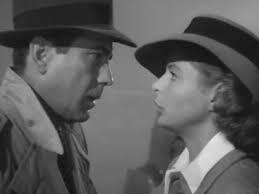 Convicts and fugitives that enter Casablanca have a hard time leaving to America, because the police keep a close watch on them. Enter Victor Laszlo, (Paul Henried) the most wanted Czech of them all, and it’s up to proprieter Rick Blaine (Humphrey Bogart) to see to it that Laszlo doesn’t leave. The only thing standing in the way is Laszo’s wife, Ilsa, (Ingrid Birgman), who just happens to be Blaine’s ex-lover. What works with this movie? Number one: the screenplay. Not only was the story very engaging, but the dialogue was so clever. Six of the lines have made it on to AFI’s top 100 film quotes, but there are many other brilliant lines in this movie, whether they be emotional, clever, or funny. Number two: the ensemble. While Bogart doesn’t have the charm that Clark Gable has, he still does a very good job carrying the picture. All of his cast members are very enjoyable too, including Henried, a captain played by Claude Rains (nominated for his performance). But my favorite of the bunch is Birgman, who manages to be the kind of girl you want to see the hero get. Number three: the guilds. Editing, cinematography, score, art direction, costume design.. Not one crew member flubbed up and the result is sheer perfection. I’ll admit, I was holding off on this one mainly because of the Oscars. I wanted to focus mainly on seeing on all of the nominated films and didn’t really pay attention to this one movie that came back in 1942. But this movie truly is the masterpiece that it’s built up to be. See it if you haven’t already.